It is a dress that you can wear for wedding ceremony and stone party lately. Wedding dress is a dress that you will find every season of water! Kink details at the waist, even the back ribbon is a point Sparing one volume overall! 2. It is good to wear ~ until summer by thin chiffon material to be visible. 3. One-piece dress that can be worn by anyone with a short length! It is a dress that makes waist line look tight with a wide smoke banding treatment on the waist ~! Delicate taping More High-quality One-piece dress with high quality! One-piece dress that was popular enough to sell more than 10,000 copies last year! I'm a Good Knit One Piece! It is a dress that fits well with important guests as well as guests looking! It's a solid texture and it's nice to wear without any scratches and make Chic details thin. I can wear it in Chic atmosphere with one piece of dress. Span is good and it covers the sashes perfectly because of shearing. The lace color motif lightens the light of the moment when you wear it. Wedding ceremony is a dress that will make me stand out in many of these days. It is a Trench dress with a sense of refined sophistication. 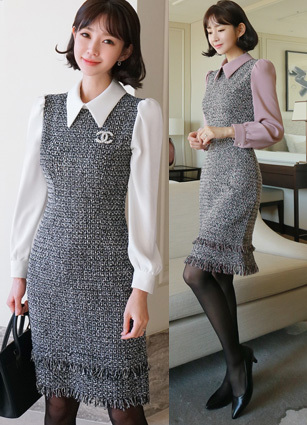 Brand Double-button Kara made in the same process One-piece dress! 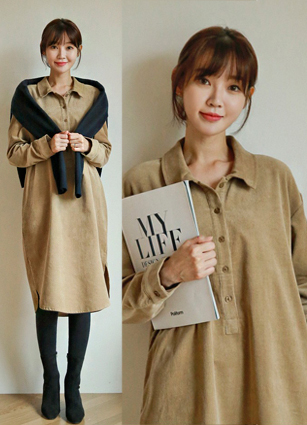 A worn-out shirt dress, side, belt, and pockets are so perfect! It's a Nageurang Long Dress with a twist on the waist! Chic One-piece dress that feels special even in purple color! One-piece dress Is not it really lovely? I feel a sense of coming up on my knees to make my line more beautiful! It is a jersey dress that I will buy again if I try it once. More More Chic Sensuality Geometrical Pattern Diagonal Rap Dressup as VolumeUP! It's a one-piece dress that you can peek at even if you wear it with another inner! Knit, Skirt Even with single item, you can use up to set coordination Good Two-piece !! It is the dress of the date when the color and the pearl button becomes the point. It's good to wear feminine while keeping Pretty Pit all day. Slim Piece feels luxurious with pearl tie and sleeve color! Ramsoul is more warmth than normal wool UP! Model I also own a String Golgi Knit Dress! Combination of colors and Bling one gold button Chic point effect properly! Overall, the body looks small and slim looking. It's really pretty to wear separately, especially Knit is a loose fit. Produce a slim fit while the volume is cut and cut line! Now is the time to prepare a one-piece dress for storage at year-end meeting? Tweed material pearl button with a light moment to wear! There are pockets on both sides, so not only design but also practicality High Shirt One-piece dress! I wear Warm Corduroy even in winter. You can wear a thin pretzel vertically.